DETROIT (Reuters) -- General Motors said it is buying wind energy to power production of some its biggest SUVs at a factory in Texas. GM said in a statement today it has agreed to buy 30 megawatts of energy from a Texas wind farm operated by a unit of Spanish renewable energy company EDP Renovaveis SA. EDP is developing a 250 megawatt wind farm in Edinburg, Texas. 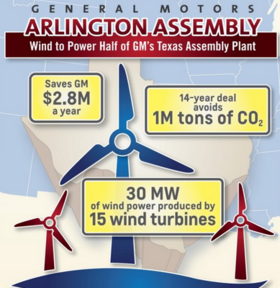 GM will use the wind-generated electricity to power production of Chevrolet Tahoe, GMC Yukon and Cadillac Escalade SUVs at its factory in Arlington, Texas. Over the course of the 14-year deal with EDP, GM said it will avoid more than 1 million metric tons of carbon dioxide emissions, "equivalent to the emissions of 112 million gallons of gasoline consumed." That's roughly the amount of gasoline that would be consumed by a fleet of 134,400 Chevy Tahoes over the course of a normal year of driving, based on U.S. government fuel efficiency estimates. GM builds more than 200,000 large SUVs a year at the Arlington plant, and has announced plans to expand production there. GM's announcement, which comes amid negotiations in Paris toward an international agreement to cut greenhouse gas emissions, also offers a response to persistent criticism by environmental groups of the carbon dioxide emissions from big SUVs like the Tahoe and Escalade. Demand for SUVs in the U.S. has surged during the past year as gasoline prices have fallen, even as sales of hybrid cars such as the Toyota Prius have dropped. A Tahoe can burn 18.3 barrels of oil a year, according to federal government estimates, compared to 6.6 barrels a Prius would consume. GM said that it also plans to use wind energy to help power three facilities in Mexico beginning in the first quarter of 2016. With those agreements, GM said it expects to exceed a promise to use 125 megawatts of renewable energy by 2020.